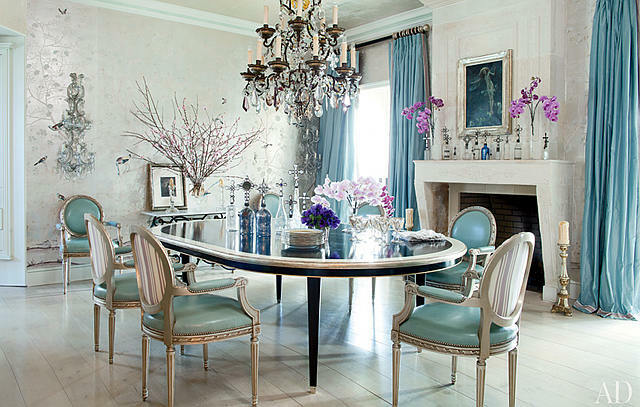 Chinoiserie has been slowly making a comeback, and has been in our minds for spring. Feeling the weight of all that dirty snow lining the streets? These delightful patterns will snap you out of your funk, enticing you to think of chirping birds and delicate spring blossoms. The word is french in origin, meaning “Chinese” or “in the Chinese taste”, describing an originally European style of ornamentation that was incredibly popular in the seventeenth and eighteenth centuries. The use of Chinese motifs and techniques adapted to Western art, furniture, and architecture has stood the test of time in many textiles, pottery, wallpapers, and furniture designs. There is a great variety and range of details and scenes that evoke this sophisticated and exotic detailing, giving it quite a bit of flexibility in use for design. Owning objects such as these used to be considered a status symbol, when travel to the Far East was a luxury that few afforded. Even though the root of the word ties it to Chinese style, many of the elements that you see in Chinoiserie decor actually aren’t chinese at all, or have been interestingly adapted in a fantastical style. Real elements combine with fantasy to create something fun and pretty. In the 20th century, Hollywood Regency interior design made use of dramatic accessories in a Chinoiserie style, often incorporating bamboo-inspired furniture, urn lamps, and screens. Most recently, Kelly Wearstler has incorporated Chinoiserie patterns in to her designs. Generally, the patterns tend to carry a connotation of sophistication, being well-traveled, and classy. It can definitely add a touch of delicate opulence to any room. Now, we’re seeing a lot more incorporation of chinoiserie patterns in to modern design, rather than just in to traditional. New ways of incorporating the patterns (such as in tile, or paired with unexpected combinations) are providing inspiration to many. Follow New England Design and Construction’s board Chinoiserie on Pinterest. Not all chinoiserie decor is black and gold- find some spring colors to get you through the melting snow. for more decorating and home improvement tips!